2. How to differentiate Pelvic digit from lesions like osteochondroma? Volume 2 | Issue 4 | JOCR Oct-Dec 2012 | Page 19-22 | Moreta-Suárez J, Sáez de Ugarte-Sobrón O, Sánchez-Sobrino A, Martínez-De Los Mozos J. Department of Orthopaedic Surgery and Trauma, Galdakao-Usansolo Hospital, Barrio Labeaga s/n 48960 Usansolo (Vizcaya) Spain. Fax: 944007132. Address of Correspondence: Dr Jesús Moreta-Suárez, Department of Orthopaedic Surgery and Trauma, Galdakao-Usansolo Hospital, Barrio Labeaga s/n 48960 Usansolo (Vizcaya). Spain Fax:944007132. Email: chusmoreta2@hotmail.com. Introduction: The pelvic digit or pelvic rib is an unusual congenital anomaly with a finger or rib like bone formation in soft tissues around normal pelvic skeleton. This is a benign lesion and mostly an Incidental finding on radiographs. Most reported cases are asymptomatic and do not require intervention. We report a case of symptomatic pelvic rib that required surgical excision. Case Report: A 57-year-old man presented with a long history of pain and functional limitation in his right hip. On plain radiographs a fusiform bony structure adjacent to the acetabulum was noted. 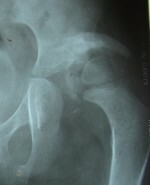 The imaging tests (MRI and CT) suggested the diagnosis of pelvic digit. We performed surgical excision of the lesion through anterior Smith-Peterson approach. The histopathology showed presence of corticomedullary structure. After surgery the patient’s symptoms were relieved. Conclusion: It is important to recognize this lesion on plain radiographs and to confirm by CT scan and make differential diagnosis. 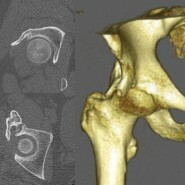 In the majority of cases the pelvic digit is asymptomatic and no treatments is needed. However in cases where symptoms can be attributed to pelvic digit an excision will relieve the pain and disability. Keywords: Pelvic digit, pelvic rib, iliac rib, bone growth and development.